I can barely let an hour go by without using technology. I anxiously fidget with my phone once every seven seconds. I carry my iPad around the house under my arm at all times. And I can barely find my way to the local supermarket without having turn-by-turn directions shouted at me from my smartphone. You can definitely call me an addict. That’s why I was morbidly curious when I heard about Camp Grounded. 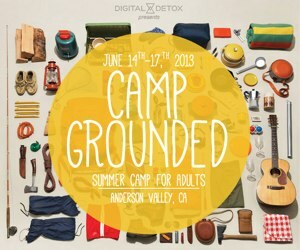 Hosted at a 1970s style Boy Scout camp in Northern California, Camp Grounded bills itself as a summer camp for adults with a twist: If you want to attend, you have to agree to unplug entirely for the duration. That’s right – no tech is allowed. Things at camp aren’t left up to the honor system here. Tech devices like cell phones, tablets, and computers will have to be checked in with camp security, where they’ll be put under lock and key for the duration of your stay. Even digital cameras are forbidden, though campers are encouraged to bring along old school film-based and Polaroid cameras. If campers can keep their tech withdrawal in check long enough to step out of their cabin, they’ll find a number of throwback summer activities. You can swim, rock climb, hike, participate in creative workshops, and play a game of capture the flag, among other activities. And, of course, no summer camp would be complete without roasting marshmallows. If kids were doing it in 1975, Camp Grounded visitors will be doing it, too. The concept has proven popular so far: The first Camp Grounded weekend, scheduled for next month, has already sold out. This tech addict, however, will be staying at home in the nice, cool air conditioning. After all, if I want to know what my life would be like without technology, I’ll just re-watch Diehard 4. On my laptop.